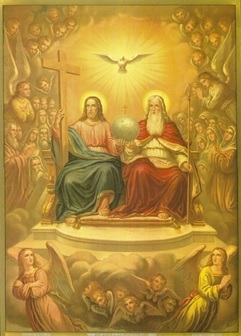 As indicated in Acts 7:56, Jesus rules over the world from his heavenly throne at the right hand of the Father. This is the Messianic Kingdom. What is the Messianic Kingdom? Was the Messiah Expected to Rule from an Earthly Throne? The Messiah was to reign in Jerusalem. (Psalms 2, Isaiah 24:23) And after the end of the age, Zion or Jerusalem was to become the capital of the Messiah’s kingdom. (Isaiah 2:2) But which Jerusalem? According to Hebrews 12:22 and Galatians 4:26 there is also a Jerusalem in heaven. Hebrews 12:22 reads, “But you have come to Mount Zion, to the city of the living God, the heavenly Jerusalem. You have come to thousands upon thousands of angels in joyful assembly[. ]” Galatians 4:26 also mentions a Jerusalem that is in heaven: “But the Jerusalem that is above is free, and she is our mother.” Daniel 4:26 suggests that Christ will reign from the Jerusalem that is in heaven during the Messianic kingdom since according to Daniel 4:26 it is heaven that rules over the earth: “The command to leave the stump of the tree with its roots means that your kingdom will be restored to you when you acknowledge that Heaven rules [emphasis mine].” Isaiah 25:6-8 appears to echo Daniel 4:26. In these verses, the Messiah is said to hold a banquet in Zion or Jerusalem for those raised from the dead. In John 18:36 Jesus says, “My kingdom is not of this world.” In this simple statement, Jesus clarifies why he advocates paying taxes to Caesar in Matthew 22:21. Jesus never intended to be the earthly king over a sovereign Israel. When Jesus declares that His kingdom is not of this world, Jesus is saying that His kingdom is in heaven. In Acts 7:56 Stephen looks up to heaven and sees Jesus at the right hand of the Father. Acts 7:48-49 states, “[T]he Most High does not live in houses made by men. As the prophet says: ‘Heaven is my throne, and the earth is my footstool.’” The fact that Jesus rules at the right hand of the Father places the throne of the Messianic kingdom in heaven. The Messiah rules the earth from a heavenly, not an earthly throne. Peter makes this fact clear in Acts 2:22-36. The fact that Jesus rules the world at the right hand of God in heaven is also indicated in Hebrews 8:1 and Revelation 3:21. This is why Jesus calls His kingdom the kingdom of heaven throughout the Gospels. The kingdom of heaven is the Messianic kingdom. What is the Messianic Kingdom? Who are the People of the Messianic Kingdom? In the verses above, one can see that the Messianic Kingdom is in heaven where the Messiah, Jesus Christ, rules over the true Israel, those Jews and Gentiles who are the spiritual descendants of Abraham. What is the Messianic Kingdom? 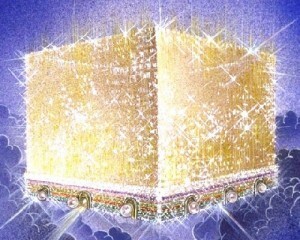 The Messiah’s Throne is in Heaven in Fulfillment of Jeremiah 33:20-21. Jesus was a descendant of King David and many expected him to rule over a sovereign Israel as did His ancestor King David. However, the Bible records the breaking of the covenant of the day during the crucifixion; and Josephus records the breaking of the covenant of the night in A.D.66, the year of the initial appearance of Christ during his second coming. See Jesus, the Son of Man, was LITERALLY Seen in the Clouds in A.D. 66. 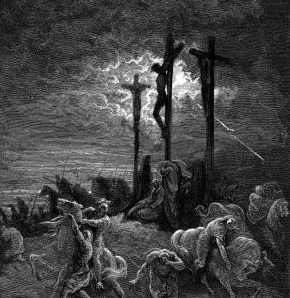 The miraculous darkness during the crucifixion is a sign from God pointing to the breaking of God’s covenant with King David in fulfillment of Jeremiah 33:20-21. Night came in the middle of the day during Jesus’ crucifixion. For three hours darkness covered the land until Jesus’ death at the ninth hour according to Matthew 27:45. This miracle is a sign of the breaking of God’s covenant with King David according to Jeremiah 33:20-21. Since the Israelites had killed their Messiah, Jesus would not rule over them on earth. A light shown from the Temple in A.D. 66 so bright that it turned night into day. This miraculous event which transpired in the same year as the second coming marked the complete fulfillment of Jeremiah 33:20-21. See Historical Evidence that Jesus, the Son of Man, was LITERALLY SEEN in the Clouds in the First Century. Day came in the middle of the night in A.D. 66, the year of the initial appearance of Christ during His second coming: “[O]n the eighth day of the month Xanthicus [Nisan] and at the ninth hour of the night, so great a light shone round the altar and the holy house, that it appeared to be bright daytime; which light lasted for half an hour.”3 This omen is a sign pointing to the complete fulfillment of Jeremiah 33:20-21. On the eighth day of Nisan in A.D. 66 day came in the middle of the night pointing to the fact that the Messiah would also not rule corporally on earth upon his return. On the 21st day of Iyyar, a little over one month later, Jesus came on the clouds of heaven in the presence of the heavenly host as He had so often promised. As a result of the miraculous breaking of the covenant of Jeremiah 33:20-21, Jesus did not reign corporally in Israel after His second coming. Both miracles which fulfilled Jeremiah 33:20-21 occurred in the middle of the month of Nisan at the ninth hour. Darkness covered the land during Jesus’ crucifixion around Passover during the ninth hour of the day according to Matthew 27:45, and a mysterious light turned night to day at the ninth hour of the night on the eighth of Nisan according to The Wars of the Jews 6.5.3. 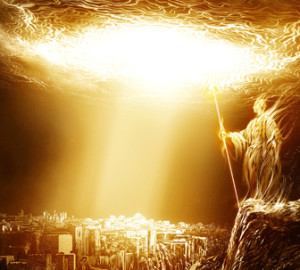 Descriptions of heaven in near-death experiences often strikingly resemble the new Jerusalem. The Messianic Kingdom is Centered in Heaven: Evidence from Near-Death Experiences suggests that the New Jerusalem Exists Right Now! The Messianic kingdom is called the kingdom of heaven throughout the gospels because it is centered in heaven; and it is here that the saints will ultimately experience a blissful, loving existence with their king and Messiah after death. Did God ever Intend Christ to Rule on Earth? If Israel sinned when It asked for It’s First King, Why Would the Messiah Rule as King over Israel on an Earthly Throne? Sadly many Christians today expect Jesus to return in the future and reign physically on earth as king in Israel. Many of these Christians also believe that Satan is the ruler of the earth and “god of this world” and yet “there is no material demonstration of his supposed earthly kingdom.”6 If it was ever God’s intention that Christ reign as king on an earthly throne, then why did the Israelites sin when they asked for an earthly king? Wasn’t God already ruling spiritually over Israel from His throne in heaven prior to the coronation of Israel’s first king? If Israel sinned when it asked for an earthly king to reign over earthly Israel, does it make sense for Christ to reign as king on earth over the earthly kingdom of Israel after the end of the age? Wouldn’t one expect that after the end of the age Christ would rule over His kingdom in a manner similar to the way in which God ruled over Israel before Israel sinned against God?7 Furthermore, if “heaven rules” according to Daniel 4:26, how could Jesus rule over heaven and earth if His throne on earth is subordinate to heaven? Interested in THE PRETERIST VIEW OF ESCHATOLOGY, or are you a PRETERIST struggling with a prophecy or verse? It DID happen just like the Bible says! If you liked this essay, see PRETERIST BIBLE COMMENTARY for a detailed explanation of the FULFILLMENT OF ALL MAJOR END TIME PROPHECIES IN THE BIBLE. The more unbelievable the prophecy, the more amazing and miraculous the fulfillment! Also see Historical Evidence that Jesus was LITERALLY SEEN in the Clouds in the First Century. For an explanation of how the end of the age and its fulfillment during the Jewish War mirror Genesis 1-3; how the Bible teaches that the resurrection of the dead is a resurrection of heavenly bodies to heaven, not a resurrection of perfected earthly bodies; and how the resurrection is a mirror opposite of the fall see How the Jewish War and Resurrection to Heaven Mirror Genesis and the Fall; and How Preterism fixes the Age of the Earth Problem and unravels the Mysteries in Genesis. The fulfillment of Jeremiah 33:20-21 in the miraculous darkness of A.D. 33 and light of A.D. 66 explains why Christ did not rule corporally on earth in the Messianic Kingdom. These men then went on to say that Christ’s kingdom “would make its appearance at the end of time, when He shall come in glory, and judge the living and dead[. ]” www.earlychristianwritings.com/text/hegesippus.html, cited in Gary DeMar and Francis X. Gumerlock, The Early Church and the End of the World, (Powder Springs, GA: American Vision, Inc., 2006), 43. Mal Couch, Dictionary of Premillennial Theology, (Grand Rapids: Kregel, 1996), 266, cited in Dr. Kenneth L. Gentry, Jr., He Shall Have Dominion: A Postmillennial Eschatology, third ed. (USA: Apologetics Group Media, 2009), 149. Josephus The Wars of the Jews 6.5.3. Don Piper and Cecil Murphey, 90 Minutes in Heaven: A True Story of Death and Life, (Grand Rapids: Revell, 2004), 34-35. Gary DeMar and Francis X. Gumerlock, The Early Church and the End of the World, (Powder Springs, GA: American Vision, Inc., 2006), 51. Brian L. Martin, Behind the Veil of Moses: Piecing Together the Mystery of the Second Coming, (USA: Xulon Press, 2009), 136-137.